The Nile river, the father of African rivers and the longest river in the world. It rises south of the Equator and flows northward through northeastern Africa to drain into the Mediterranean Sea. The Nile River in Egypt is one of the world’s most magical rivers and a cruise on it is the perfect way to enjoy ancient Egypt’s History. The Nile River has huge significance in regards to ancient Egypt - most of ancient Egypt’s historical sites are located along the banks of the Nile River including cities such as Luxor and Cairo. Cruising is the best way to discover Upper Egypt. Nile cruise ships are also called floating hotels where you can enjoy the journey soaking in the wonderful sights of Egyptian history and 5000 years of culture slowly drifting by. 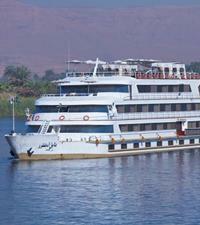 Nile cruises often visit a wider variety of antiquities along the banks of the River. But equally important, they also allow the tourist to gain a prospective of rural Egypt. Visit Tutankhamun’s tomb at the Valley of the Kings and marvel at the magnificent Abu Simbel temples. Explore the Jewels of the Nile on a Nile River cruise from pyramids to monuments and other antiquities. 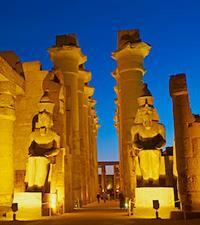 Cruise from Aswan to Luxor via Kom Ombo, Edfu & Esna and visit the world renowned monuments and secluded islands. In the first two days, you’ll get to explore the High Dam, the Granite Quarries and sail to the Temple of Philae and Kom Ombo. 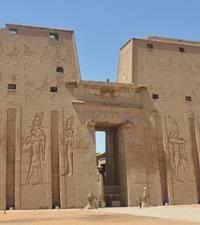 On Day three sail to Edfu and discover the Horus Temple of Edfu. On day four you will get to see the best of Luxor, visiting the Temple of Karnak, Hatshepsut’s Temple, the Valley of the Kings and Queens, and Luxor Temple. From Aswan you can also visit the World Heritage site Abu Simbel. It is Egypt’s southernmost country located to the South of Cairo and offers most magnificent views of the Nile River and Nile Valley flowing through the granite rocks and emerald island with tropical palms. At Aswan you can discover the cultural & historical monuments like the Temple of Philae, The High Dam, Unfinished Oblique, Mausoleum of the Aga Khan, Aswan Souk - a lively Egyptian bazaar and the Museum of Aswan. From Aswan one can explore other islands and places like the Elephantine Island, Lake Nasser, Kitchener’s Island and Saluga & Ghazal Islands. It is the Agricultural capital of Egypt and famous for the Temple of Kom Ombo. The Kom Ombo is a double temple where the southern half is dedicated to crocodile god Sobek, god of fertility & creator of the world Hathor & Khonsu. Whereas the northern half is dedicated to falcon god Halos the Elder. Mummies of crocodiles are displayed inside the temple. It is 65 miles north of Aswan and is a very religious and commercial centre. The main attraction is the temple of Horus. It was also called the Greek city of Apollinopolis Magna. It is Egypt’s Historical capital and known as ‘world’s greatest open air museum’. The number and preservation of the monuments in the Luxor area are unparalleled anywhere else in the world. Luxor is divided by the Nile into East bank and West Bank. East Bank is a more modern man made city with gardens, traditional bazaars, restaurants and hotels are located. West bank is the historical and ancient city where one can explore the Valley of the Kings, Valley of the Queens, temple of Luxor, Colossi of Memnon, Karnak temple, temple of Habu and temple of Hatshepsut. A Hot Air Balloon ride early morning is the best way of seeing Luxor light by the early sunrays while floating in the clouds. Abu-Simbel a very small village that lies 280 km south of Aswan. Abu Simbel has become an extremely popular tourist destination, due to its tremendous significance in the world of archaeology. These temples run from Abu Simbel down the river to a place called Philae that is near Aswan. 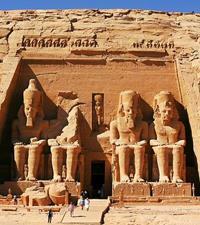 These temples are lasting monuments for Abu Simbel and his Queen Nefertari. They were carved from mountains and this was done during the reign of the famous Ramessess II around the 13 century BC. 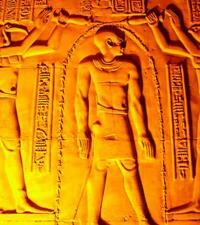 They denote Power and pride as were built as a symbol of victory after the battle of Kadesh. To preserve them from getting eroded these monuments were relocated to a higher artificial hill in 1960. 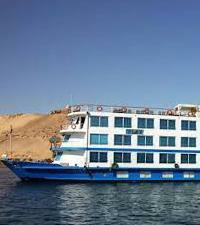 It is visited by flight from Aswan or you can also take a bus or convoy. One of the most relaxing and enjoyable thing to do in Egypt is sail on the River Nile. Enjoy the morning sun, chirping of birds, seeing fisherman cast their nets and explore the ancient Egyptian culture and history. There are many cruise companies operating here which offer cruising at different levels - Standard Five Star, Deluxe Five Star and Super Deluxe Five Star. In Egypt, the land immediately around the river is hot and dry. Between May and September temperatures can hit 40 degrees. Night times are slightly cooler, with temperatures dipping into the 30s. In winter, the temperature drops to around 14˚C in the day and 10˚C at night. Best time to visit is between October to March. It’s a good idea to pack a jumper or a light jacket if you want to get out on the deck of a cruise ship after dinner. Oberoi Hotels and Resorts offer unparalleled luxury cruise experiences, on the Nile and the Kerala Backwaters. These are special river cruises which offer just the right blend of impeccable service, luxury and quiet efficiency, hallmarks of Oberoi Hotels & Resorts worldwide. Their ships are intimate and offer their guests much more than just a cruise - its more for an experience. 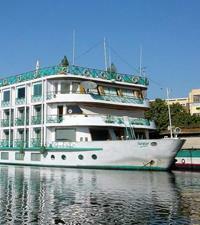 The Oberoi Zahra Luxury Nile Cruiser, is the jewel of the Nile. On a seven night cruise, guests will discover ancient monuments, magnificent temples and five thousand years of Egyptian culture, in supreme style and comfort. The Oberoi Zahra offers the finest spa facilities, in a luxurious haven of peace and tranquility. It houses a theatre, library and cigar lounge and also holds astronomy lectures. The staterooms are luxurious with all amenities and have high windows. The restaurant serves international cuisines. On The Oberoi Philae, Luxury Nile Cruiser, discover a world of ancient beauty while enjoying a trip thousands of years in the making. Enjoy this fabulous journey and explore amazing sites with the help and teachings of onboard Egyptologists. Sleep in elegant rooms, bright and comfortable with modern style and a soothing atmosphere. Relax in marble mosaic bathrooms, complete with a steam shower and picture window looking out over the Nile. The restaurant serves exquisite food among the finest surroundings. It features a fitness centre and plunge pool up on the sun deck. 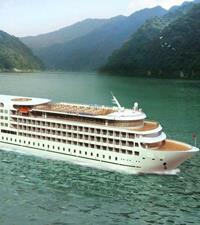 Viking Cruises offers both river cruises and ocean cruises. Its river cruise division grew to be the world’s largest river cruise line, and currently offers cruises along the rivers of Europe, Russia, China, Southeast Asia and Egypt. Float along the life-giving Nile on MS Mayfair, enjoying comfort and style the ancient pharaohs could only dream of, and witness the monuments of ancient civilizations that once flourished on its banks. Depending on your itinerary, you may also cruise across Lake Nasser on the deluxe MS Omar El Khayam. 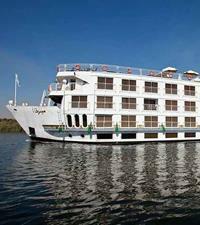 Sail in style and luxury the River Nile in a manner once reserved for queens and pharaohs on Uniworld River Cruises. 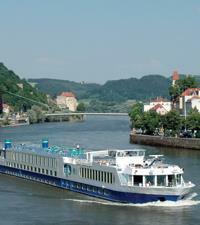 Set sail on an eight-day voyage onboard the all-suite River Tosca. An enchanting land of marvels, myths, and wonders old and new, Egypt is an extraordinary destination no culturally curious traveler will want to miss. Sonesta the 5 star cruising company sails the majestic Nile River between Luxor and Aswan in the comfort and modern luxury. It offers elegant, modern accommodation in cabins and suites with broad panoramic views of the River Nile. The amenities include discothèque, a restaurant, room service, jogging track, gym, bars, nightly entertainment, guided excursions, pool and sun deck. Sonesta’s fleet of Nile River cruise ships offer 3-, 4-, and 7-night trips between Aswan and Luxor, exploring the Cultural & historical landmarks of Egypt. The ships that cruise the Nile are the Sonesta Nile Goddess, Sonesta Sun Goddess, Sonesta Moon Goddess, Sonesta Star Goddess and the Sonesta St. George I offering truly memorable experiences of a lifetime. Movenpick cruise ships offer luxurious on-board travel while exploring the mysteries of 7,000 years of Egyptian civilization. A visit to the city of Edfu is just a small part of the plan, other visits include exciting trips to cities of Kom Ombo, Aswan and Luxor all situated on the banks of the longest river of the world, the Nile! These cruise ships offer everything you wish for: swimming pool, sundeck with a recreational area, a selection of outlets and a reading, playroom and traditional and ultimate luxury. Experience a fascinating way to travel and relax at the same time. Some of the ships sailing the Nile are M/S Royal Lily, M/S Royal Lotus, M/S Sunray, M/S Darakum, M/S Harees, S/S Misr, S/B Feddya, Prince Abbas etc. 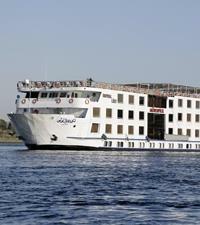 The Presidential Cruises are 5 star luxurious cruises on the River Nile. It owns and operates 6 boats which are tastefully decorated in a classic and elegant fashion and are fully air-conditioned. Cabins on board Presidential Nile Cruises are simply and tastefully furnished, and equipped with all modern amenities. It offers a Spa, outdoor pool, international restaurant, night life, movies & game library, live entertainment and sports facility. 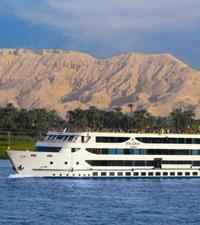 Presidential Nile Cruises sail from Luxor to Aswan and back on a 7 night itinerary. The luxurious boats are MS Nile Commodore, MS Nile Odyssey, MS Nile Ritz, MS Nile Plaza, MS Nile Symphony and MS Nile Admiral. The tradition of luxury Nile cruise is carried on well by Abercrombie Nile Cruises with their 2 elegantly designed and upscale service ships - 'Sun Boat IV' and 'Sun Boat III'. Cruise the Nile in comfort and with the best Egyptologists to unveil the historical secrets and culture of ancient Egypt. These ships follow the timeline of Ancient Egypt on a journey that takes you from Cairo and the pyramids to a luxury cruise on the Nile to Luxor, remote Denderah, Edfu, Kom Ombo, Aswan and commanding Abu Simbel. The Amarante Nile Cruises is a world of comfort and supreme luxury sailing to the upper Egypt in their twin ships of MS Amarante Osiris Nile & MS Amarante Isis Nile. All cabins onboard Amarante River Nile luxury cruise ships feature large panoramic windows with a view of the Nile River, all tastefully furnished in an elegant, classical pastel décor with antique style prints. Both these ships feature international restaurant, sun deck bars, outdoor pool, night entertainment and modern cabin amenities. It sails for 3 or 4 nights on the River Nile between the historical ports of Luxor and Aswan, stopping along the way to sightsee at the Valley of the Kings, the temple of Karnak... and some of Egypt's most famous monuments. Travco Group owns and operates a fleet of 21 Nile cruise ships, built to international specifications, for live-aboard excursions - under the Jaz Hotels, Resorts & Cruises and Travcotels brands. While staying on board for three or four or seven nights, travelers experience the thrill of discovering Egypt's historical landmarks and the tranquility of its rural scenery as they cruise down the Nile. 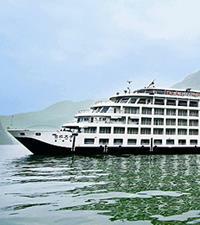 This company operates standard, Deluxe and luxury cruises for all types of travelers. The romance and sheer wonder of a Nile cruise holiday can be experienced in supreme luxury on any of Travco's opulent fleet. Some of the ships that sail the Nile are Jaz Jubilee, Jaz Regency, Jaz Royale, Crown Prince, Crown Jewel, Lady Sophia, Regina, Regent, Nile Empress, Steigenberger Minerva and many more. Typical Nile cruises are either three, four or seven nights. The shorter tours usually operate between Luxor and Aswan, while the longer cruises travel further north to Dendera, often offering day tours overland to more remote locations. The Felucca offers boat ride on the Nile River. These boats, with their wing-shaped sails and float on the river Nile. A picnic lunch can be arranged on the same. Dinner cruises can also be arranged on the Nile which is accompanied by a belly dancing show.